In Dinajpur, Bangladesh, Selina Akter, second year midwifery student, plays the role of a mother as students practice postnatal care at the Dinajpur nursing institute. The United Nations population agency today urged governments and development partners to expand midwifery programmes and promote an environment where midwives can effectively serve the needs of women and their families. “Midwives save lives, support and promote healthy families, and empower women and couples to choose whether, when and how often to have children,” said Babatunde Osotimehin, Executive Director of the UN Population Fund (UNFPA) on the occasion of International Day of the Midwife. “They also help avert sexually transmitted infections and prevent disabilities like obstetric fistula, mother-to-child transmission of HIV and female genital mutilation,” he added. Each year, more than 300,000 women die during pregnancy and childbirth. The UN also estimates that some three million babies do not survive the first month of life, and another 2.5 million are stillborn. 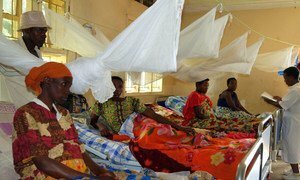 “Most of them could have been saved by the care of well-trained midwives within the framework of strong health systems,” Dr. Osotimehin said. This year's theme for the Day – 'Midwives, Mothers and Families: Partners for Life!' – underscores the important roles that these women and girls have in preventing maternal and newborn deaths and empowering women to make informed, healthy choices. These are critical aspects of achieving the Sustainable Development Goals (SDGs), which seek to alleviate poverty and assist the planet, by the 2030 deadline. Also today, the UN World Health Organization (WHO) reiterated the importance of midwives washing their hands and maintaining hygienic standards. Worldwide, 30,000 women and 400,000 babies die every year from infections, such as puerperal sepsis, often caused by lack of water, sanitation and poor hand-washing practices.